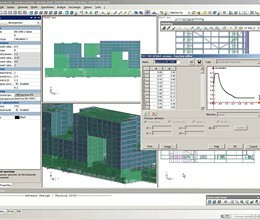 Advance Design is a complete integrated analysis / design software dedicated to engineers. It conducts static and dynamic analysis of 2D and 3D structures, from bridges and culverts to buildings and towers. This module is fundamental and supports all other modules. It performs 2D/3D static analysis (linear, geometric non-linear and with released members and supports). Beam and plate elements with 6 DOF per node are supported. This module performs modal, spectral, linear / non-linear time history and transient analyses. Informationon levels for each seismic directionandinter-story drifts is provided. Calibration of spectral analysis in accordance with selected building code, inelastic & torsional effects are included. Pall friction dampers can be used for non-linear TH analysis. The cyclic design process optimizes / verifies steel members and bolted connections. Static, dynamic, moving Loads and foundation design results are part of the process. 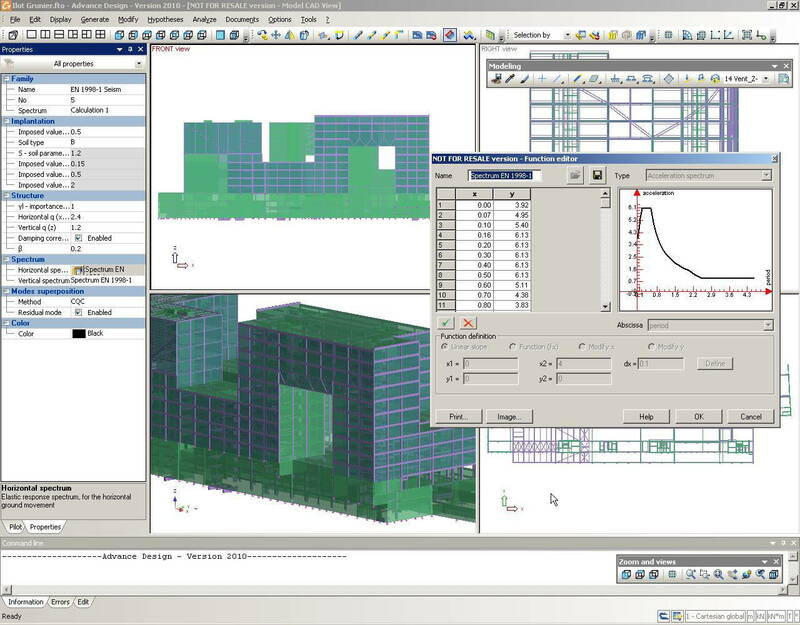 The module also provides capacity design for ductile frames, design briefs, composite beams with construction stages, studs, editable ratio (Esteel / Econcrete) for long-term and short-term effects, and automatic calculation of effective lengths. This module optimizes / verifies wood structures, using a cyclic iterative process. Notches and bearing widths are considered into resistance calculations, correction factors, duration factors, fastenings, sawn timber, glue-laminated and composite, treated wood, incised and fire retardant. Detailed design brief is provided, including resistance of fastenings. This module verifies / optimizes tower members. It features cable elements with large deflection, ice and wind load generator, specific equations for Kx, Ky and Kz according to bracing types, and graphic results for upright members. Geotechnical and structural verification and design of footings with or without soil-structure interaction, rebar placement in shallow foundations. Calculation of bearing capacity. Verification of deep foundations (point bearing and friction), lateral deflection, and design load for pile or group of piles. Optimizes / verifies rebar placement for continuous beams, columns, shear walls and 2-way slabs. Features: standard, FRP, epoxy coated reinforcing bars and meshes, detailed and editable rebar placement, drawings, crack control, 3D interaction curves and graphic results. Pre-tensioning or sequential post-tensioning, composite beams, construction stages including4 levels ofprestress, shrinkage-creep effects, effects due to secondary prestress, design of main reinforcing bars and stirrups, prestress losses and gains, stresses and deflections under service loads at each construction stage, ratio of stresses in cables, stress variations due to fatigue, and graphic results. Generation of 26 culvert structural models (e. g. , slab, footings or pedestals) with design specifications, applied loads and moving loads. Calculation of moving load distribution through the backfill. Generation of load combinations and load factors according to inspection level, type of traffic, etc. Live Load Capacity Factor for steel, concrete and prestressed concrete members. Member and cable deterioration are included. This module is used to analyze moving loads acting on bridges, overhead cranes or structures supporting mobile equipment. Three truck paths can be specified in one project. A moving load case generator is provided. Results can be integrated into static analysis load combinations. * Advance Design download link provides trial version of the software. Advance Design has been rated 2.3 out of 5 points. A total of 7 votes cast and 0 users reviewed the software.